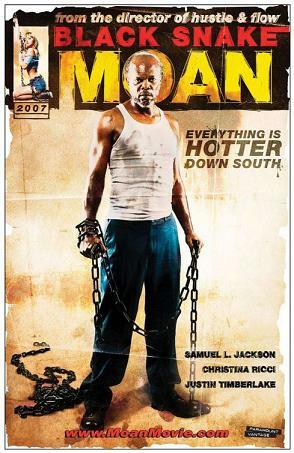 Samuel L. Jackson stars in Black Snake Moan, directed by Craig Brewer, as Lazarus, a bluesman who develops a friendship with Rae (Christina Ricci), a young, troubled girl who he chains to a radiator to try to tame her. Justin Timberlake plays her boyfriend, Ronnie. Samuel L. Jackson's previous films include Snakes on a Plane, Freedomland, The Man, Coach Carter, S.W.A.T., The Negotiator and, most famously, Pulp Fiction. He will soon be seen in 1408 and Resurrecting the Champ. I had the privaledge to interview him. Paramount Vantage will release Black Snake Moan on March 2nd, 2007. NYC MOVIE GURU: What attracted you to play the role of Lazarus? SJ: I just thought it was a kind of interesting, gothic love story in a way. These two characters develop affection for each other that never becomes sexual. It’s interesting in that aspect because people would expect that it would escalate to something else just because they’re in this particular [isolated] place. The fact that neither one of them met a person like the other one before was intriguing to me. That’s always good for some character resolution that’s unusual. I just thought it would be something audiences would enjoy and I’d enjoy encountering it as an actor. NYC MOVIE GURU: How did you create the look of this character? SJ: The make-up artist and my hairdresser and I found an interesting way to make him look like my grandfather’s brothers. Being able to disappear into the character by putting moles on my face and changing the shape of my nose is always good for me so when I look in the mirror I know I’m somebody different and to be able to carry him differently. NYC MOVIE GURU: What was it like to sing and play the guitar at the same time? SJ: A little daunting at first. As I got more and more familiar with the guitar and what my skill level was and how I was advancing in it, I got more comfortable playing and singing at the same time. I don’t necessarily say that I learned to play the guitar, but I did learn to play those songs. There was a great deal of satisfaction in being able to do that. NYC MOVIE GURU: How did you learn to play the guitar? SJ: Interestingly enough, I was [New York City] and I was walking through the Waldorf (Hotel) and somebody told me Eddie Levert was looking for me at the Rock n’ Roll Hall of Fame [held in the hotel] backstage, so I went backstage and I’m standing there watching U2 perform and this voice comes up behind me and says, "You should play a bluesman in a movie. Let me teach you how to play guitar." I turned around and it was this woman, Felicia Collins, who plays for The David Letterman band. At that time I hadn’t even heard about Black Snake Moan so I kind of laughed and said, "Yeah, right." She gave me her number and then I got Black Snake [Moan] the next week. I went to the Academy Awards and in the gift basket there was a Gibson studio model guitar to order that they make for you. Then I met [director] Craig [Brewer], and I got the job, I had the guitar made and came back to New York to make Freedomland and [Felicia Collins] became my guitar teacher. Then I went to do Snakes on a Plane [and] the prop master was an awesome guitarist, so he saw me with a guitar strung across my back and said, "Oh, you play?" and I said, "No I gotta learn to play for this movie I’m doing," and he said, “Oh I’ll help you.” The next thing I know, he’s in my trailer every day for hours drilling me, so by the time I got to the movie I’d learned to play all those songs. NYC MOVIE GURU: Did you meet with any Delta bluesmen? SJ: To actually go down into the Mississippi Delta with Craig and the music supervisor and hang out at Juke joints and sit and talk to old blues musicians on their porches and play with them and kind of figure out what I was trying to do with the guitar, and what that mind-set is of guys who work all week at something else and on the weekend they’re kind of rock stars because the guys that we were visiting were super famous for a 20 mile radius. Then nobody outside of that 20 mile radius knew who they were. They were awesome musicians. NYC MOVIE GURU: What was it like acting with Christina Ricci? SJ: During the rehearsal period, we could see that something special was going to happen and that our relationship was a lot larger off the page than it was on the page. Christina [Ricci] and I know each other very well. We interact socially and we have the same agent, but we never worked together. There was an enormous amount of respect between us about what we do. As we started to rehearse, we gained this trust that became essential for these characters to have to do the things they had to do inside that house. NYC MOVIE GURU: Did you think it’s controversial for Lazarus to chain Rae to the radiator? SJ: No, I didn’t think it would be. I just assumed people would [see] that image and think that there’s something perverted is getting ready to jump off in the movie. But that’s the way to get people inside the film and see these two characters. I didn’t think that in this day and age it would be a big deal to have a black man chaining a white girl to a radiator in that particular way. I guess maybe some people still think that because it’s set in the South and the look of the film, who he is and who she is would be somewhat controversial. NYC MOVIE GURU: Were the chain scenes rehearsed? NYC MOVIE GURU: What did you think of Justin Timberlake’s performance? NYC MOVIE GURU: What is Craig Brewer like as a director? SJ: Craig [Brewer] was a kid actor, so he, kind of writes in actor’s head in a way. He tries to avoid giving performance notes in a specific kind of way. He [does] have a specific idea of tone and how he wants that to work [and] he has a good sense of rhythms of Southern people and how they speak. He writes dialogue that’s interesting to say and that’s [also] what I say about Quentin [Tarantino]. He’s familiar with the territory that he writes about. In order to cement himself in Hollywood, he has to do a film about white people now, so he’s doing [a] country music movie.